I finally completed the third mountain landscape I was after the other day when fireworks exploded at dusk instead. But first! Some extremely quick, extremely furtive sketches of random strangers at the library the other night. I want to thank Kerfe at https://methodtwomadness.wordpress.com for sharing her photos of Western Carolina yesterday. I don’t know what it is about North Carolina, but it feels like home to me. The first photo of the mountains at the link above was just what I needed to inspire my third painting, and it was a pleasure to use as a reference. I don’t believe in coincidence. I believe it was meant to be, as I’d searched my own photos and others online, and Kerfe’s photo was “just right”, said Baby Bear. Who’s dancing? I know I am. The day we’ve been waiting for is here! Make the most of it. Let’s hope the watercolor gods bless me with something good this weekend. And all of you too! *flings Friday joy to all* Peace. Art. Happiness. Whoa, a trifecta! That painting really captures the atmosphere of those mountains, including the hazy morning sky. And Mary Oliver…always appropriate for the natural world. This poem is perfect. That’s a nice sketch page too. I like especially the way you’ve captured the different postures. My favorites are the man with the hat and the child with the backpack. Thank you so much! I’m so happy you liked it. I loved all of your photos, but that mountain one grabbed me by the neck. Boy, those quick sketches were hard. I’m glad I did it but not sure when I’ll be trying again lol. Well, and honestly, you’re good at it! So I could see why you might wanna do it more often. Are you able to people watch from your window? You live in the city, right? I can see people walking on Broadway, although not sure I would be able to draw them…might be worth a try though. Looking down on them? Interesting perspective. Or at a distance, across the street. Could be really cool! Worth trying! Oh Laura – such an awesome post – the poem – I read it twice – the sketches – wow – such a challenge — and you rocked it with the backpack kiddo! – then the watercolor – oooh! the grand finale – so peaceful – tranquil – soothing. So much in one short post. Thank you for sharing it all! I’m so glad you enjoyed it, Jodi! *flinging joy all the way to Mars* 💜 Happyyyyyy Fridayyyyyyyy! You did so well with this one! Congratulations 🙂 and big smiles! Thanks, Rebecca, I’m so glad you think so! I really like it, but I think mainly because it’s the first time I was able to make a painting look fairly close to the reference. Or maybe to say it more clearly, I was able to get it close to what I pictured in my head when I set out. I approached it in a good mood, not in frustration, which is what made the fireworks the last time. I’d like WC to be a bit more predictable, but that’s probably like wishing the sun wouldn’t wake me so early in the morning lol. Ain’t gonna happen! Thanks for your comment. Yes, I too find that having a clear picture in your head first helps enormously. 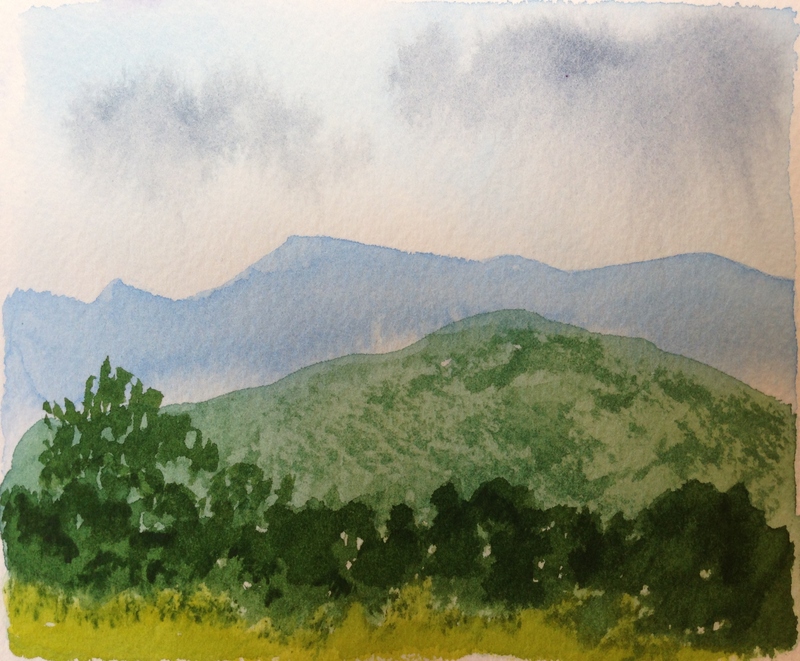 Predictability and watercolours? For me the massive step forward was understanding that a puddle of colour on dry paper makes a crisp edge of paint, whereas flooding paint onto wet paper gives blends and bleeds, as does flooding clear water into paint. Maybe like me you find the unpredictability both beguiling and frustrating. Like you say, it’s the nature of the beast! You have totally captured this beautiful scene! Love it. The mountain painting is amazing! Truly! And you also did a great job with the life sketch. I am also very shy so I don’t sketch out in public much because I’m not confident enough yet in my abilities. But I know how hard it is to draw things/people that are moving! I think eventually, we’ll get good enough at it. My friend Suzanne at anopensketchbook.com does wonderful life sketches at cafes and other public places. But, she is an art instructor and has been doing this for ages. You and I will get there with practice! 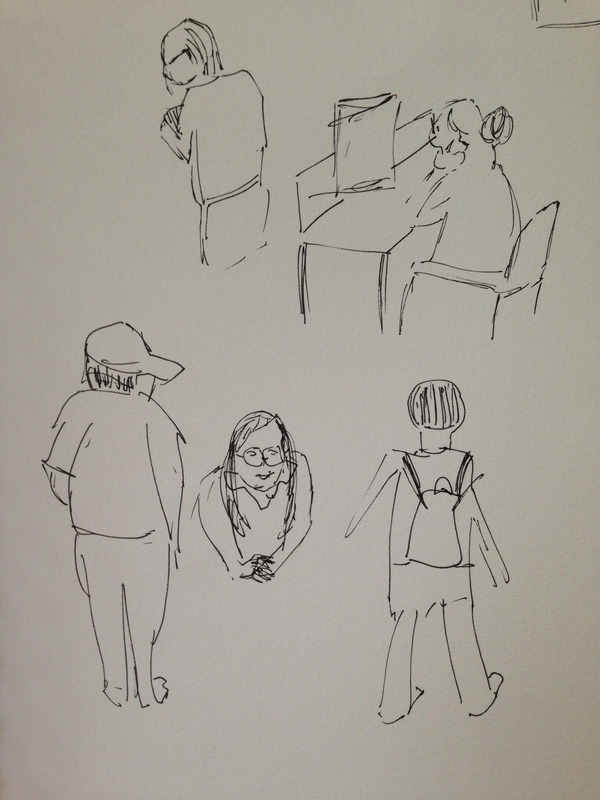 I am so excited you went people sketching at the library. Please keep going you are off to a great start with your people. Good captures. Yes, if only they would standstill! The landscape is really good. You inspire me to try more landscapes! Carmel, I’m so glad you’re happy to see these, as I was tempted not to post them! I hope you do try landscape work. Boats? I may try a seascape this weekend. We’ll see what the painting gods have to say for themselves. Maybe I’ll try people sketching again! Thx for your encouragement! The mountain is a wonder. It almost looks like a photo. You’ve really captured that well. Another peaceful scene. But those clouds! Holy cow! I can almost feel the rain. I’m crazy about your quick sketches. I can’t figure out what is so fetching about quick sketches–they seem to capture so much posture/expression/feeling/life. Thanks, Kirk! I’m glad you like it. The clouds weren’t supposed to look so brooding. I added the paint too quick and it bled a bit too much. There’s lots of sunshine in the foreground which doesn’t really go with the broody sky but overall I was happy with it and I learned a few things, so it was good. Wow, crazy about the sketches, huh? I almost didn’t post them, except I promised them to you and a few others – I wouldn’t have. I did skip the ones I did at the post office parking lot, lol! I admire you for drawing people who can tell you are drawing them! I don’t have the courage for that. You’re probably much more outgoing than I am. I’m just one of those people who blend in with the background. Plus I have a stupid look on my face most of the time, so people look away out of pity. It’s a great strategy. Great post! I’m dancing now! Jo, you’re always dancing, girl! 😀 ❤ Glad you enjoyed it! I am. That’s to both, dancing and enjoying your post. Nice watercolor work! Thanks! The gods were with me yesterday! lol. The gods were with me the other day too, they just wanted fireworks at dusk! I have learned to love that painting too. Thanks as always for your comments. Lovely poem, fun people sketches and AWESOME landscape! WOWZA! Laura! Look at you go girl! YOU ROCK! I find my people sketches look a lot like yours BUT I think we are still have our training wheels on. We are training our eyes to see and our hands to follow. I’m going to keep at it and I hope you will too! 😊 Enjoy your weekend! Thank you, Jill! I really appreciate your kind comments (as always). Yes re: the training wheels!!! 😀 No doubt. I will keep at it, and I’m glad you will too. Have a great weekend, lady! Beautiful poem, and I know what you mean, trying to sketch anything while it’s moving. Love the painting and the different hues. Thank you so much! Mary Oliver makes everything better. Thanks for the visit, too!